Greene: Could Mike Ditka have altered U.S. history? Mike Ditka's chose not to run against Barak Obama for the Senate in 2004. Could Mike Ditka, the former head coach of the Chicago Bears, have changed the course of U.S. history? It’s not that farfetched a question. Briefly, in the summer of 2004, Ditka was being pursued by Illinois and national Republican leaders to step in and run for the United States Senate against a newcomer to the political big leagues: Barack Obama, an Illinois state senator. Jack Ryan, who was expected to be the Republican nominee on the November ballot in the Illinois race that year, had dropped out, and his party was scrambling for a replacement. They approached Ditka; he gave it serious consideration, and then, citing family and business obligations, said no. The Republicans, in a puzzling move, then recruited Alan Keyes to come to Illinois from Maryland to run against Obama. Obama trounced Keyes, and now, if everything goes his way, may be a few weeks away from the presidency. But what if Ditka had chosen to oppose Obama four years ago– and what if he had defeated Obama and been elected to the U.S. Senate? “It would have been interesting, I'll tell you that,” Ditka said over the phone. From our journey on the campaign road I had called him in Chicago, to see if he, too, had thought about what might have been. A lot of people in Illinois thought Ditka had a pretty good chance to win, had he accepted the invitation to run. Remember: four years ago, Obama was a relative unknown. He was back in the state senate after having been defeated badly in a 2000 primary in which he sought to run for the U.S. House of Representatives. Ditka, on the other hand, was one of the most famous– and in many, many places, beloved– people in the state of Illinois. He was controversial, yes, but that’s what his admirers liked about him. He was instantly recognizable in every corner of the state– he would have drawn enormous crowds to rallies. Mike Ditka, the icon, against Barack Obama, the novice? Had Ditka run and won, there isn’t a way in the world that Obama would have been in the race for the White House now. And history would have been completely rewritten. Ditka, by the way, is no home-field supporter of the presidential candidate from Illinois. So does he have any regrets about not running against Obama back in ‘04? 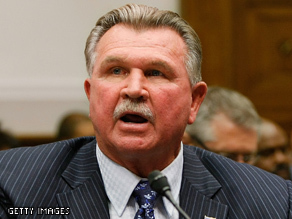 “If the wrong person gets into the White House, I’ll regret it,” Ditka said. Then I take it he’s not a fan of Obama? Had he run, and had the voters of Illinois elected him, instead of Obama, to the U.S. Senate, Ditka said he is certain of one thing: “I would have worked hard for them. I’m a patriot. We have been a guardian of the world, like it or not." No one will ever know what might have happened. It’s hard to remember now just how little known Obama was four years ago– and it’s impossible to overstate just how renowned, in Chicago and in Illinois, Ditka was. So, Coach? If you had decided to run? Do you think the political world would be in a completely different place right now, as Campaign ‘08 nears its end?